A resume is one of the most important tools in a job seeker’s arsenal. A resume is an advertisement; you are advertising yourself for the job. If the advertisement is ineffective, then people won’t buy the product, i.e. hire you. A resume, also spelled résumé and resumé, should list your skills, experience, and achievements that make you eligible for the job. Keep these points in mind, while writing a resume. Keep it short. 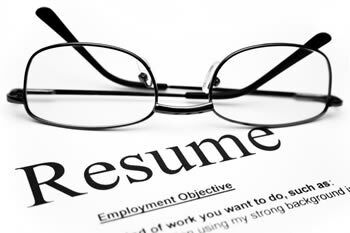 A resume should usually be a page or two long, no more unless absolutely necessary. It should highlight the skills, experience, and achievements for that job and not include your entire life history. If the resume is too long, chances are that most people won’t read it. Use a professional font. Times New Roman is ideal. Arial or Calibri are also recommended; Comic Sans however is not. The font should be 11 or 12. The sub-headings and headings can be a different font, but try not to use more than two different fonts or go over the size of 14 or 16. Instead, sections can be bold or italicized in order to differentiate them from the others. All text should be black, no color. Choose a layout that you think highlights your resume and best fits your profile. For example, if you are a student, choose a layout that highlights your education, whereas if you are an experienced professional, then choose a layout that highlights your work experience. On the top, create your heading. This should include your name, address, contact number, email, etc. Then depending on the layout, fill in your work experience, educational qualifications, skill sets, etc. Highlight the ones that are most likely required or useful for the job you are applying to. Also provide any references that you may have, any awards and achievements that you may have earned, any volunteer work you may have done. Use keywords strategically. Use keywords that are related to the job and the industry, such as research, writing, editing, etc. for a writer. Many companies now scan the resumes first for industry specific keywords in the first round of selections, either by themselves, or with the help of software. Spell check and proofread your resume. There should be no spelling mistakes or grammatical errors in the resume. If possible, get someone to proof read the resume for you. They may also help point out ways in which you can improve your resume. now i know that resume is one of the most important tool in applying for a job,so i'm will keep it my mind.